For fans counting down the days until Star Wars: The Force Awakens is released on blu-ray, another layer of awesome anticipation has just been added. 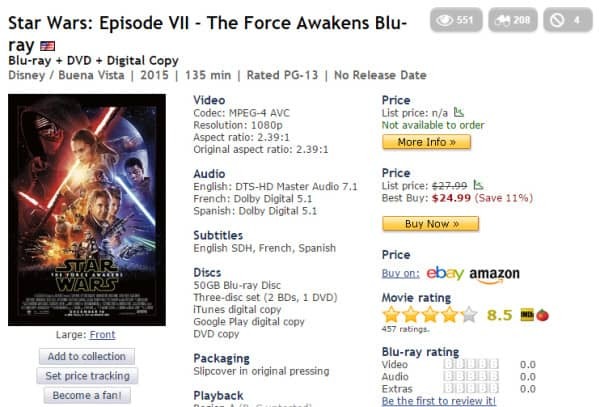 The Force Awakens blu-ray will be released as a 3-disc set according to a screen shot from Blu-ray.com‘s website. The set includes two Blu-ray discs and one DVD disc according to the image. Speculation has already began on what could be included within the set along with the movie. Here is hoping for more behind the scenes footage. No official announcement has been made by Disney and Lucasfilm regarding the release. Star Wars: The Force Awakens has already grossed over $2 billion internationally. The Force Awakens featured Daisy Ridley, John Boyega and Oscar Issac, along with original cast members Harrison Ford, Carrie Fisher and Mark Hamill. Episode 8, directed by Rian Johnson, is currently in production and is scheduled to be released on December 15, 2017.